Every MBA student is taught very early that it is much more expensive to find new customers than to keep the ones you already have. Marketing professors usually say it costs 5 times more. After dispensing this fact, MBA schools then structure their marketing curriculum to focus almost entirely on tactics to obtain new customers, and almost no coursework relates to retaining the ones you have. In practice, most companies spend a lot more money and time on customer acquisition than on concerted efforts to keep the ones they have happy. The math is clear. We once had a client that bragged in their literature that they retained 90% of their customers each year. 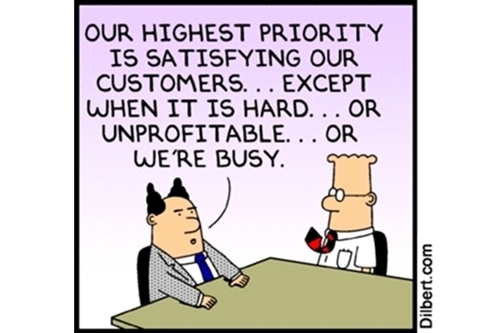 If that is the case, in 5 years they will have 59% of their customers left and in 10 years there will be 35% left. Clearly, customer retention is important to business success, and likely deserving of more emphasis than it currently receives.